If you still like your PC games to be tangible things rather than bits of code floating in the aether and you also enjoy eye-wateringly pretty adventure games, then Double Fine has you covered. Schafer and Co, using eldrich rituals and blood sacrifice and a deal with publisher Nordic, are squeezing Broken Age onto a disc and then putting said disc in a box that you can hold in your hands. 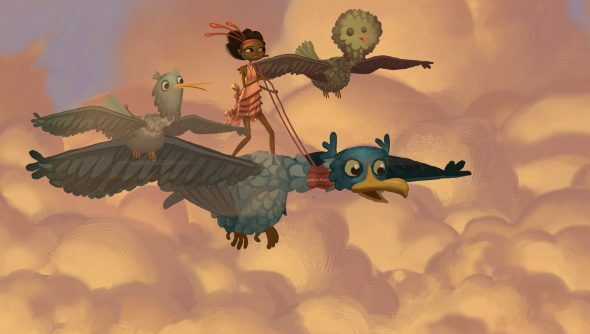 The retail version of Broken Age will magically appear in shops this spring to coincide with the launch of – finally – Broken Age Act 2. The game was split into two after the studio ran into money trouble, even though the Kickstarter exceeded its $400,000 goal by $3 million. That Broken Age Act 1 was excellent – if a little soft on the puzzle side – softened the blow of the long wait, and Schafer has promised some trickier conundrums for the second part.